Street Food Festival is back with its mouth-watering new dishes. After the success of Baku Street Food and Sweet November festivals, the team of the Meal for Real culinary project with the support of the Icheri Sheher State Historical and Architectural Reserve hosted a new project to delight foodies. 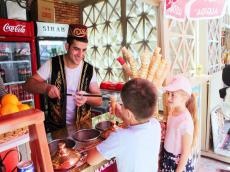 Summer Food Fest opened in Azerbaijan's capital on June 15, Trend Life reported. The food festival once again aroused great interest of Baku residents and foreign guests who came here for rest, entertainment and delicious food. Every day from 11:00 to 23:00 about thirty restaurants and cafes of the capital represent not only their favorite dishes, but also a special menu for guests. The main feature of the festival is affordable price. For example, if one dish usually costs 20 manats, it will cost you only 5 manats at the festival. At the same time, all restaurants observe the high level of food quality and safety. A gastronomic feast is organized in the heart of Icheri Sheher, near Gosha Gala. Every day from 11:00 to 23:00 various quizzes from restaurants, master classes, entertainment for children, themed evenings - Indian Night, Jazz Night, Voice of Summer Food Fest, etc. await you at the festival. Thanks to the variety of entertainment, the festival will be fun both for children and their parents. There is also an exhibition of various dishes, sale of products and souvenirs. Baku Summer Food Fest is a place that actually feels like a vacation for all. Hurry up to enjoy delicious street food and drinks until July 1.